for rebates here. Wondering if the refrigerator you want is energy star certified? Check here. This is a great way to save money. Basically, if the item you want is found at a store or online at a lower price, you can ask the merchant where you are buying if they can give you the competitor’s price. In other words one store matches their competitor’s price in order to make a sell. Stores like Best Buy will often match Amazon’s and other major stores’s price. This isn’t limited to online stores. I’ve been able to call Target.com and asked them to price match Target’s retail store price. Try to stack discounts. For example: Currently Best Buy is offering Free $100 Gift Card with LG Dishwasher and Range Package. 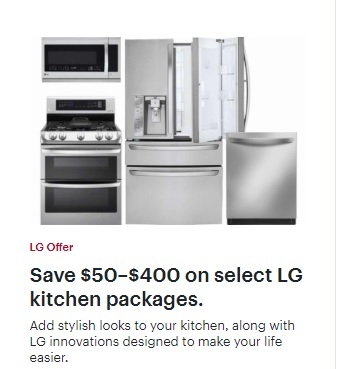 Pair this offer with current LG rebates to score bigger savings. Look for offers in Lowe’s , Home Depot and other regional and local hardware stores in addition to manufacturer rebates. Major savings can also be found on discontinued, overstock, open box and clearance items at either store outlets and manufacturer outlets. There is nothing wrong with the merchandise sold at manufacturer outlet stores. In this case, you are buying directly from the manufacturer and you may also find additional savings like free service contracts. At store outlets you can also find savings of 50% or more. Manufacturers introduce new appliance models in September, October & January. Refrigerator models tend to come out in the Spring. Dishwashers are cheaper in December. No matter the month, new models mean that since current inventory needs to be sold to make space for newer models, there tends to be lots of sales and promotions and other incentives for consumers to buy appliances. Best Holidays – Major holiday sales – Labor Day, Presidents Day, Memorial Day, and of course, Black Friday and also Cyber Monday, Christmas, & After Christmas sales. Pre-holiday sales – I find that the week of a major holiday, leading up to the weekend’s sales, one can find amazing savings. Specially the week of Black Friday. Since Black Friday deals are posted early in the week, you can compare prices to find the best sale. money. Washer and dryer bundle deals are quite popular. Consider buying the same brand of appliance to save you money. Consumers generally don’t think as their energy provider to be a source of savings for their dryers or washers. But some electric companies offer rebates for purchasing appliance. For example, buying an energy star refrigerator can save Puget Sound Energy customers $25. There are lots of ways and resources available to save money. It may require a little footwork though. Subscribe by email Subscribe to Saving with TaLis by Email and get the latest deals and other tips to save. Paid Surveys – Is Swagbucks Legit and Worth Signing Up For? 6 Months Free Amazon Prime Membership for College Students! Target RedCard Review: How Does It Save You Money?